I was watching Gordon Ramsay make a simple, yet elegant dish of pan fried scallops with crunchy apple salad on the first episode of his latest TV show Gordon Ramsay’s Ultimate Cookery Course. Immediately, I knew that I had to make that dish for Thanksgiving. It sounds like it would be great for fall while apples are being used a lot in pies, candy apples, brussels sprouts, stuffing, and other dishes. But, in my family, we don’t normally eat salads on Thanksgiving because there are so many great sides and a salad would be adding another course to an already hearty and heavy meal. 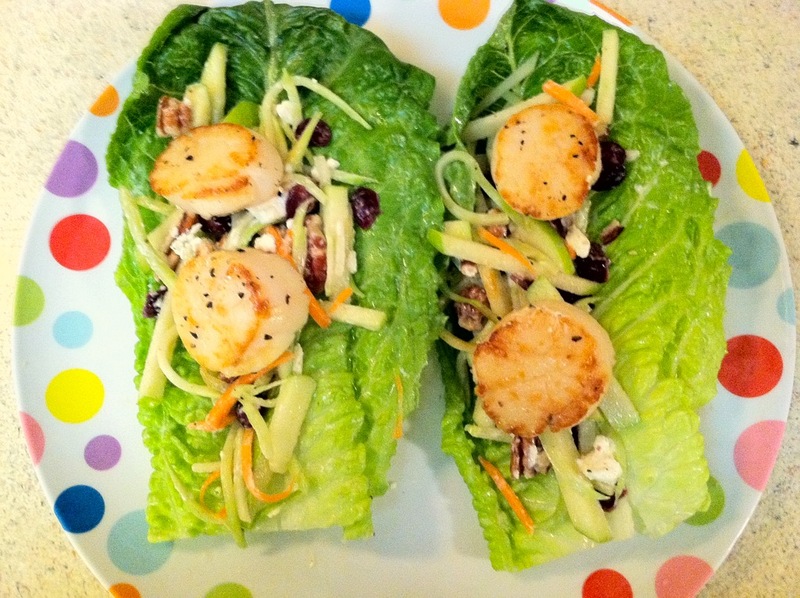 Nevertheless, I thought, “Why not make it into an appetizer?” I came up with a lettuce wrap/cup appetizer: Pan-Seared Scallops & Crunchy Apple Salad Lettuce Cups. I incorporated all of Chef Ramsay’s elements into my appetizer with some crunch, a seasonal twist with the cranberries, some sour notes, and sweet & savory combo of flavors. My family loved this appetizer experiment. I hope you enjoy it too! For the salad, in addition to the crunchy apple and dried cranberries, I used broccoli slaw that you can buy in bags in the salad section. You can of course, cut up your own broccoli slaw if you have more time. Also, for a little more texture and something a little rich to cut the sweet and sour in the dish, I added some raw pecans. Tangy and salty crumbled goat cheese was also added to the salad mix. I made a mustard vinaigrette for the salad with a citrusy Trader Joe’s orange muscat champagne vinegar to complement the scallops. This is a really yummy vinegar – great for salads! Seariously good scallops! Caramelized and beautiful! Use large, good quality scallops. Quality makes a difference in the dish. Place the scallops in the pan clockwise so you know which one to turn first. Searing the scallops and caramelizing them brings out so much flavor. Some people say it’s like candy! Whisk vinaigrette ingredients until fully incorporated. Set aside. Mix salad ingredients except crumbled goat cheese together, set aside. You want to add the goat cheese later because if you mix it too much, the crumbles will disappear into the salad. Heat a dash of oil in a pan on medium-high heat. 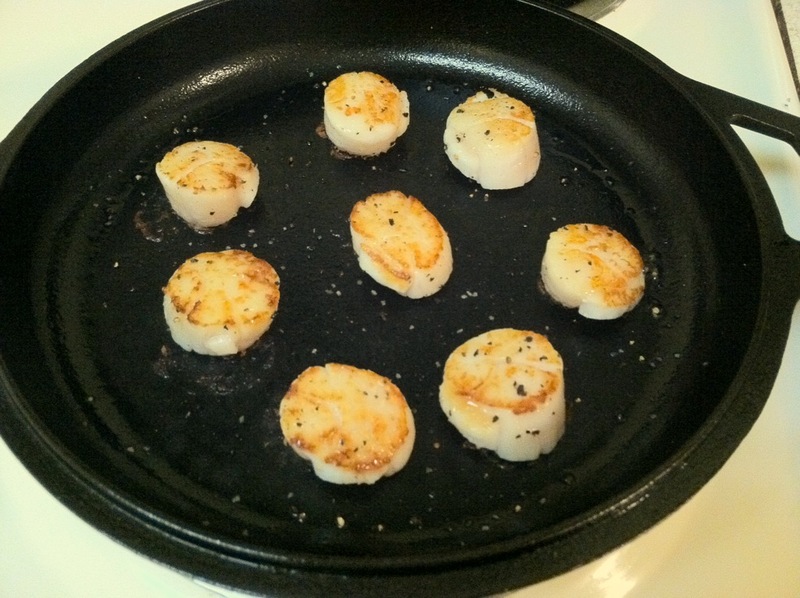 Prep your scallops: dry them well or they will steam in the pan and not sear properly. Salt and pepper one side. Once your pan is smoking a bit, add the scallops seasoned side down. Then season the other side. Cook ~3 minutes until you get a sear. Don’t touch them while they are cooking. You want to leave them alone to caramelize. You can peek after 2.5 minutes to check. Once that side is seared, turn scallops and and let them cook for about a minute or two until nicely brown and there is a good sear. Squeeze some lemon on the scallops and shake the pan to mix around a bit. Put scallops on a plate and get ready to assemble the cups. Make sure not to overcook your scallops because they continue to cook when you take them off the heat. When you poke your finger on a scallop, they should still feel springy. Combine the salad, vinaigrette, and goat cheese crumbles together. Place some salad on the lettuce cups. Top with a couple of scallops. You could drizzle a bit more mustard vinaigrette on the lettuce cups and sprinkle a bit more goat cheese. Done. 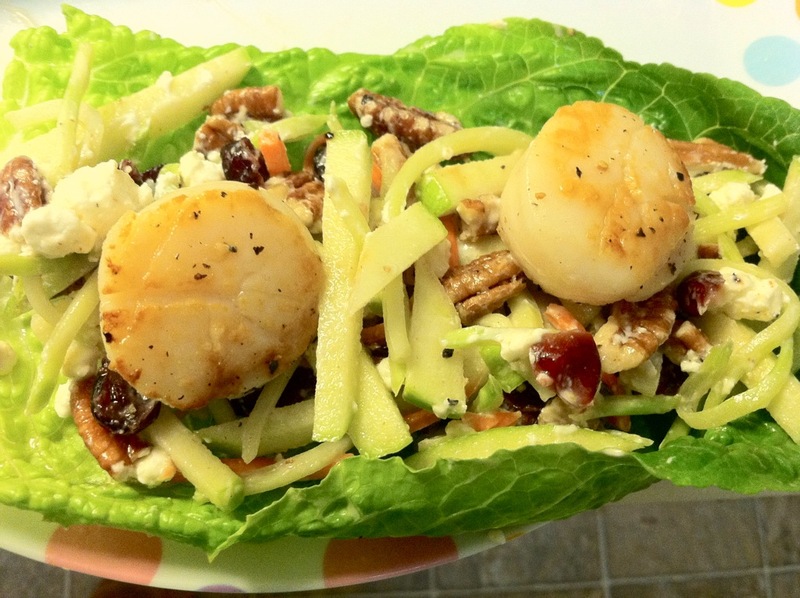 Note: I showed the eentrée/larger appetizer version, but you could do bite-size appetizers by using smaller lettuce leaves, less salad, and just one scallop. A fresh, tasty appetizer (or snack while cooking and waiting for the turkey) that won’t make you feel heavy! I am really looking forward to making these this Thanksgiving! Seriously, awesomely, crazy-delicious, lovely, and scrumptious! Now you can make these appetizers too! This entry was posted in appetizers, Cooking, Food, Holidays, Recipes and tagged appetizers, broccoli slaw, crumbled goat cheese, dried cranberries, Gordon Ramsay, Lettuce, Salad, scallops, Searing, thanksgiving, Thanksgiving appetizer. Bookmark the permalink. Wow, this looks exceptionally yummy! Thanks! I love scallops. It’s nice because this appetizer doesn’t take much effort to make. Love this! This is looking so refreshing! I just can’t wait to try this! Thanks! You could also sub some pomegranate instead of dried cranberries or have both. I hope you enjoy it! I definitely want to try this. I just hope I’m not allergic to scallops like I am with a lot of other seafoods. Scallops are probably my favorite seafood. Let me know how it turns out! I guess go to a restaurant and order a scallop dish to see if you are allergic. I got some good frozen scallops at Trader Joe’s. Those are pretty good even though they are frozen. Fresh scallops are better though. Oh Samantha, that looks delicious! Will definitely have to try this. I just need to have a girlfriend over to share this with as my family doesn’t really do seafood. Thanks! It’s a nice refreshing dish. I think you could sub chicken instead of the scallops too! Ooooh, I like ! Now I want to make it myself! Thanks! You can sub chicken for the scallops too! Thank you very much! Something about scallops that pairs well with the fruit. Thank you! 🙂 You have a nice blog! Thanks Joanne 🙂 I hope you enjoy the recipe. I think I am going to make scallops tonight now, LOL. 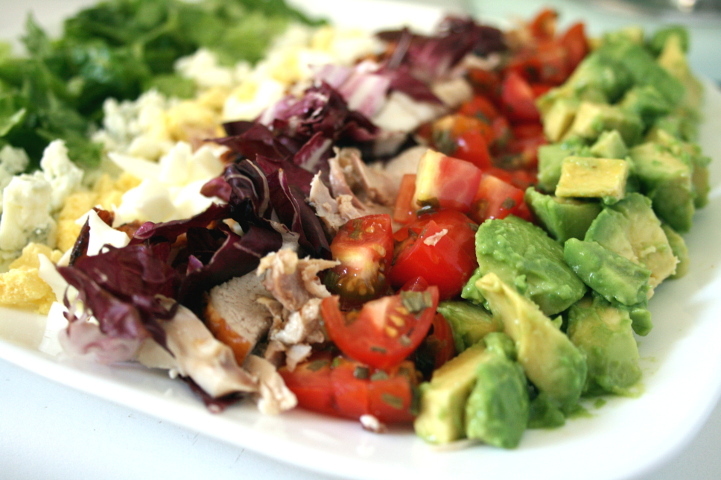 My mouth is watering on reading this recipe… have to make it soon. It is very delicious, thank you! 🙂 Next time, I’ll try them with butter lettuce leaves. Thank you 🙂 A very yummy vinegar! This looks so yummy. I def have to try. Great recipe! LOL, I know what you mean. So much food love out there. But it’s fun 🙂 Thanks for stopping by! MMMM! YUMMMM! I love Scallops and have copied and saved this to my recipe file. Thanks for the share! Looks so fresh and light. What a nice meal. Thank you and have a nice day, Laurie.